Female Transformation Of The Week - April Morris. 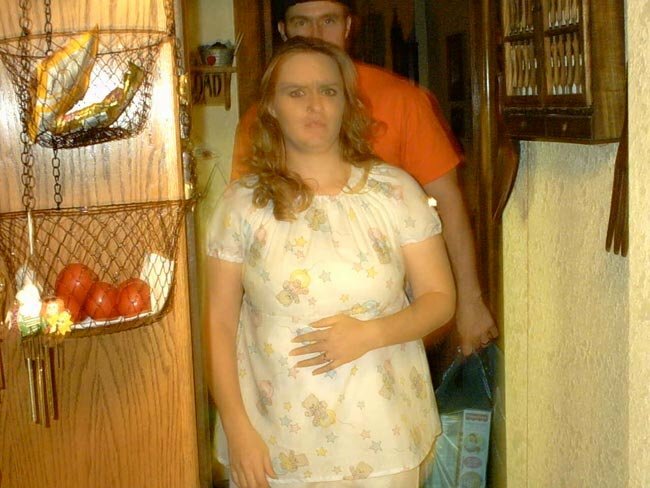 After April and her husband were married they went on an eating spree with Hamburger Helper and put on the weight. They got sick of it. Learn about the weight gain during pregnancy and how she was later able to lose 15lbs and 14% body fat! I am a 29-year-old stay-at-home wife and mother from Shawnee, Oklahoma. When my husband and I first got married eight years ago we both gained a lot of weight, it was hamburger helper every night and we would eat the whole box between the two of us in one sitting. We had some pictures taken of us and we couldn&apos;t believe what we saw - that was not us. So we entered the body for life contest as a couple. We finished in the in top 5% but after it was all said and done we went right back to the same eating habits that we had before the contest, so it wasn&apos;t really a life change. About three or so years ago I was fed up so I entered the same contest as a single, but a few weeks into the contest prep I found out that I was pregnant with our first child which was an exciting time but for my body it was the worst I had ever seen. At the end of my pregnancy I weighed 185 pounds and I was an elephant. I never thought I would lose it. So You&apos;re Pregnant: Now What? It is the time many women wait for all their lives. The time when they are going to produce a life of their own. Some people will spend years trying to become pregnant, hoping and praying. Here is some advice to staying healthy during this time. After I had our son I did a little treadmill but not enough to matter, I lost a lot of weight but I was still at 30% body fat. the turning point was this past April; my husband became a natural amateur bodybuilder and he was getting ready to do his first NANBF show. I realized that my husband was going to go to this bodybuilding show with a fat wife on his arm. I could not bear to go to this show and stand next to this beautiful man looking the way I did. I had eight weeks before his show to do as much as I could and believe me I worked hard. I wasn&apos;t a stranger to the right nutrition and exercise, we have a full free-weight gym in our garage so I had no excuse not to be working out but following through with it was something different. I started watching my husband really close and I would mimic what I was seeing him do. I did studies of my own on how to exercise properly. Then I just made the decision and just took the first step. I didn&apos;t have a personal trainer but I learned on my own and by watching Michael. My husband has been a big inspiration to me and I thank him for helping me through this journey. Now I am on to bigger and better things and I know now that with hard work and drive, no matter what I do in life, I can succeed. I am now trying to build muscle and tone up so I can stand on stage with my husband instead of sitting in the audience embarrassed of myself. My next goal is to be ready for the 2008 NANBF shows. My husband and I are now looking into becoming personal trainers and are wanting to open our own gym someday. I am planning on having free physical education classes for kids. We have so many children in the America that weigh too much and no mandatory PE in our schools. I want to do what I can to help educate people on how to lead healthy lives. Today I am happier and healthier than ever before. In twelve weeks I went from 120 pounds at 30% body fat to 105 pounds and 16% body fat. I am living proof that you can do this, you just have to make the decision, set up goals for yourself and take it one day at a time. Click Here For A Printable Log Of Leg Workout. Click Here For A Printable Log Of Abs Workout. Click Here For A Printable Log Of Cardio. Make the decision that you are going to make a change, set goals that are reasonable, make a deadline for your goals, and follow through. And remember to take it one day at a time.